Recombinant monoclonal antibody to Glycophorin A M antigen. Manufactured using AbAb’s Recombinant Platform with variable regions (i.e. specificity) from the hybridoma M2A1. Immunogen: M2A1 was prepared by immunzing BALB/c mice with human red blood cells of the M phenotype, and was screened by testing for anti-M activity. Specificity: M2A1 binds specifically to the M antigen on human erythrocytes, and shows no reactivity to N antigen. The epitope for this antibody includes the amino-terminal serine residue and sialic acid residues of glycophorin A. The reactivity of M2A1 for M antigen is pH- and salt-dependent (optimum ~ pH8-9). Blood group antigen M is located on the major sialoglycoprotein (glycophorin A) of red blood cells. Application Notes: M2A1 can bind to M antigen of glycophorin A and can be used in ELISAs, immunoblots and modified M glycoprotein can be used for inhibition tests. Note on publication: Describes the generation and characterization of M2A1 antibody against M antigen. 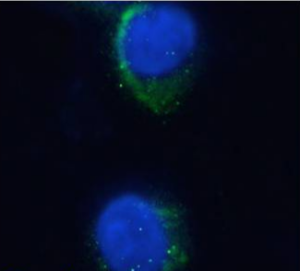 Immunofluorescence staining of fixed K562 cells with anti-Glycophorin A M antigen antibody M2A1 (Ab00789) Immunofluorescence analysis of paraformaldehyde fixed K562 cells permeabilized with 0.15% Triton and stained with the chimeric mouse IgG1 version of M2A1 (Ab00789-1.1) at 10 µg/ml for 1h followed by Alexa Fluor® 488 secondary antibody (2 µg/ml), showing membrane staining. The nuclear stain is DAPI (blue). 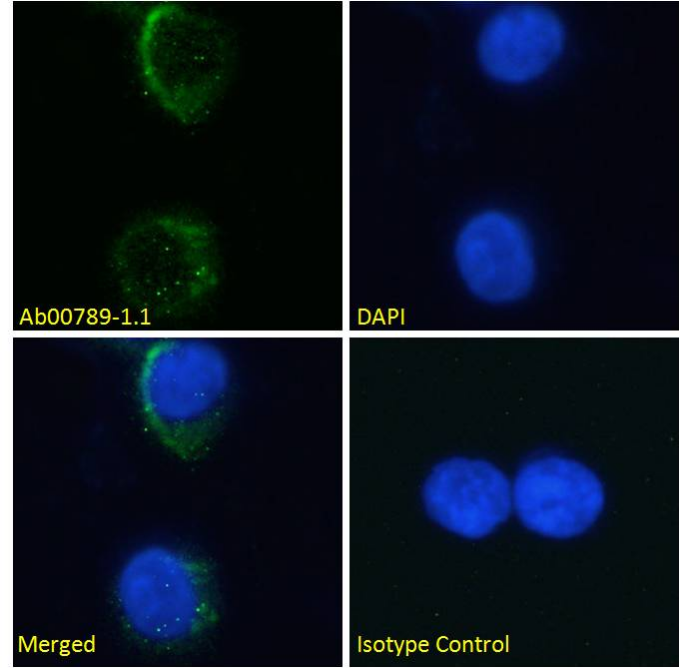 Panels show from left-right, top-bottom Ab00789-1.1, DAPI, merged channels and an isotype control. The isotype control was stained with an anti-unknown specificity antibody (Ab178-1.1) followed by Alexa Fluor® 488 secondary antibody.